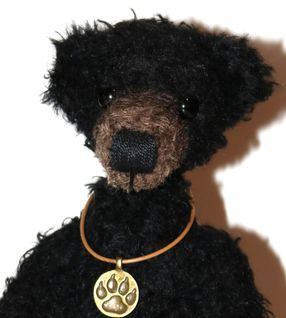 Mason is made from black curly matted mohair with a brown inset mohair muzzle. He is 11" tall. Mason has black glass eyes and his muzzle is scissor sculpted with shading. He has a black perle cotton nose. Mason has dark brown paw and foot pads with pulled toes. 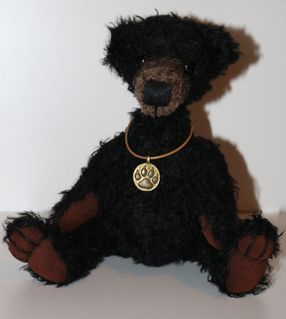 Mason is wearing a paw print necklace which can be removed. He is 5 way jointed and stuffed with poly-fil.